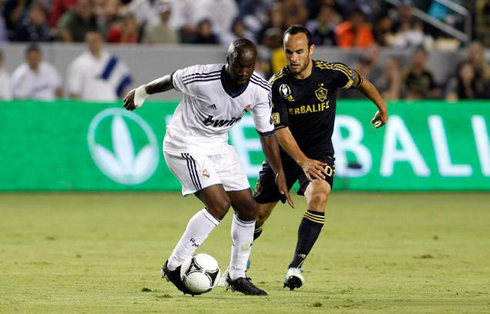 Real Madrid pulled off an easy win against the LA Galaxy, after crushing the MLS champions by 5-1, this Thursday night. Cristiano Ronaldo jumped in on the second half to get his first minutes of the season and still had the chance to show a couple moments of brilliance. Higuaín, Di María, Callejón, Morata and Jesé scored the Merengues goals in this game and will now start aiming at Santos Laguna, the next Real Madrid opponent on this pre-seaosn tour. The LA Galaxy hosted Real Madrid last night and got a small taste of the Merengues attacking power, after suffering a 1-5 loss. Cristiano Ronaldo started the game on the bench and has only played after the break, for roughly 45 minutes. The Portuguese player showed that he's still far from his best shape at this point of the pre-season, which is perfectly natural if we have in mind that he has only returned to training a week ago. In the other hand, Angel Di María and Gonzalo Higuaín had great performances during the first half and were the main forces helping the Merengues breaching the LA Galaxy defensive lines. Besides the two Argentinians, also Callejón, Morata and Jesé all scored a goal on this match, which was held in California. 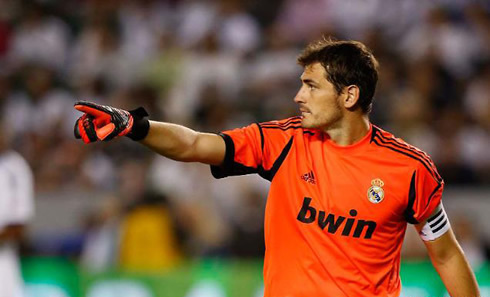 Real Madrid started the game at full throttle, with a great intensity and a very dynamic team. Angel Di María, who has clearly been the most dangerous player during the first half, ended up assisting Gonzalo Higuaín for the first goal of the night, with just 1 minute and a half on the clock. The two Argentinians showed how well they can combine when they are both in good form and easily found enough spaces to break the LA Galaxy's last defensive line. It didn't take too long for the Merengues to extend the lead and once again, Angel Di María was the main responsible for another succesful attack. After picking up the ball on the right and taking on an LA Galaxy defender, the left-footed winger striked the ball close to one of the posts and gave his team a two goal lead, with still less than 12 minutes played. Everything was looking too easy at that stage, especially thanks to the high intensity put on the field by the Merengues players. Near the 35th minute of the first half, Callejón scored the Merengues third goal of the night, after a good set-up by Gonzalo Higuaín. Even playing in a slower way, Real Madrid was able to find a way to score again and the LA Galaxy were just powerless to fight against a clearly superior side. The score wouldn't change anymore until half-time and there were high expectations to see the likes of Cristiano Ronaldo, Ozil and Benzema on the second half. José Mourinho changed the full line-up for the second period and Ronaldo was obviously one of the names included on the team sheet after the break. Playing his first minutes of the pre-season, Ronaldo witnessed Álvaro Morata scoring the fourth goal for the Merengues, after a great assist from Esteban Granero. With still close to 40 minutes left to be played at that point and with so many fresh players on the field, everyone was expecting Real Madrid to keep pushing forward. However, just like Ronaldo, many other players are still on a very early stage of their pre-season preparation, which somehow may explain the lack of intensity shown over the remaining minutes. Still, Real Madrid reached the 5th goal and the goalscorer was another youngster coming from the cantera, Jesé. It all started on a great initiative from Karim Benzema, who found Ozil with space on the right, allowing the German star to make a low cross that met Jesé ready to strike the ball. The La Galaxy goalkeeper, Perk, couldn't have done much in that situation and the final score of 1-5 was actually a fair result if we account for the amount of goalscoring chances that Real Madrid ended up creating throughout the first and second half. After beating the LA Galaxy by 5-1, Ronaldo and Real Madrid will now face the Mexican side, Santos Laguna, this Sunday night. You can watch Juventus live stream, Real Madrid vs Santos Laguna, as well as PSG vs Barcelona, Wolfsburg vs Manchester City and Brazil vs Honduras from our football live streams section.